Looking for a simple, quick and delicious treat for a snack… you‘re in the right place. 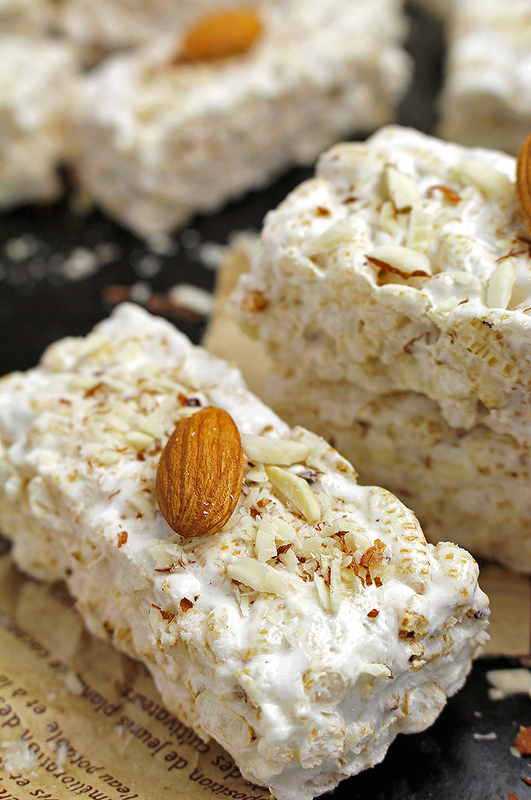 We all used to like crispy rice treats when we were kids and now here is an even better version of it – Marshmallow Rice Crispy Almond Treats. Crunchy crispy rice, melted marshmallow and coconut oil enriched with almond taste, diced into sweet, small bites. I simply adore snack time, it is my moment of peace and time to relax. While I am reading newspapers or watching TV I really enjoy delicious treats..
You will enjoy every soft and crunchy bite immensely and they are very easy to make. Take a quick look our most popular brunch and snacks recipes Chocolate Almond Granola Bars and Peanut Butter Energy Bites. 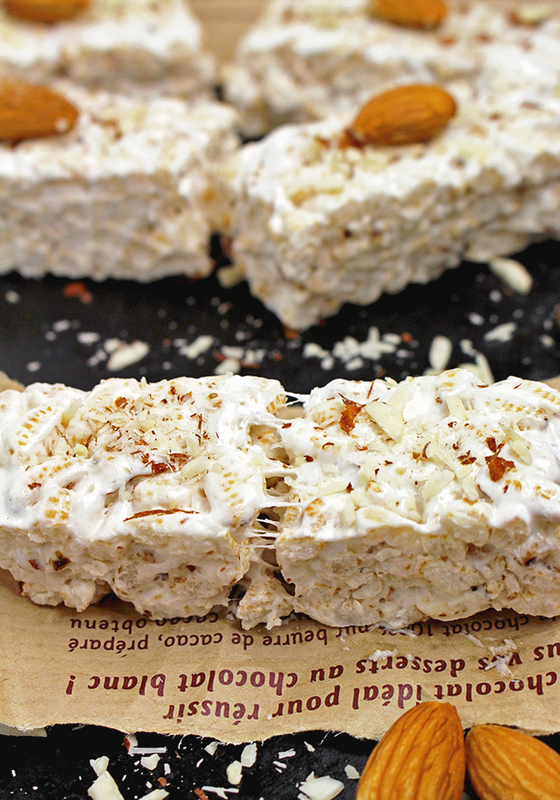 Great healthy combo of Marshmallow, Rice, Almond and Coconut Oil in one place. No bake and only 5 minutes to make :-). Can you imagine anything better? I really love them and I`m pretty sure you will love them too.. Enjoy it! 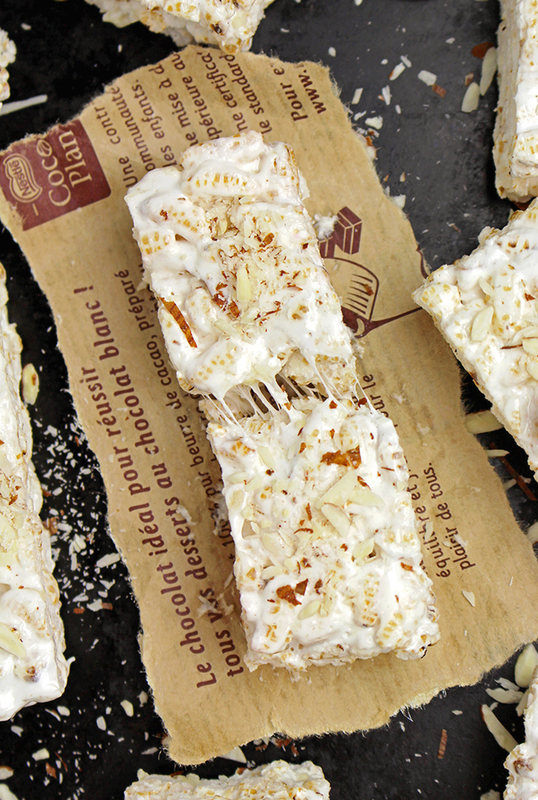 Crunchy crispy rice, melted marshmallow and coconut oil enriched with almond taste, diced into sweet, small bites. Put baking paper in an 8x8 pan and set aside. Put coconut oil and marshmallows into a big pan and stir over moderate heat until it melts (2-3 minutes). When it is melted, add vanilla extract, salt and chopped almonds, mix it together and add crispy rice. Mix well and then put into the prepared pan. Spread evenly. Shape it well using your hands or a firm object. Wet your fingers using vegetable oil if the mixture gets sticky. Sprinkle it with almonds, finely chopped. Leave it to cool for an hour, at least.